High quality genuine leather construction. Complete with spare magazine pouch. World War 2 The first P38 holsters were patterned after those for the P08 Luger. Early issue were made from top grain cowhide with a fully molded flap of the type common to European military holsters of the era. 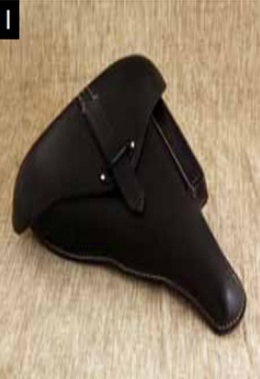 Of these leather holsters, most were black, although a few were made of brown leather. Very few were made of pebble-grain-stamped cowhide. Later holsters were made of Presstoff which was durable and easily adapted to be used in place of leather which under wartime conditions was rationed. Most of these holsters are marked at the rear with a large "P.38" and either a manufacturer's code with the last two digits of the date or all four digits of the year, and sometimes, but not always, with a Waffenamt. Two types of P38 holsters were produced during World War II; hardshell and softshell. Hardshell holsters were produced from 1939 up to 1943. After 1943, mainly softshell holsters were manufactured. All wartime P38 holsters have the same hanging system, consisting of two belt loops. This page was last modified on 12 September 2014, at 13:52.